Stanley Weintraub, author of the forthcoming Eleven Days in December: Christmas at the Bulge, 1944, shared with Opinion Journal his list of the five best personal accounts of the Second World War. Based on interviews with six atomic-bomb survivors, Hiroshima relates, with passionate dispassion, their experiences on the morning of the blast and its grim aftermath. (The account was first published in August 1946, when it filled an entire issue of the New Yorker.) Hersey offers no personal conclusions--he lets the victims do that, and their thoughts range from pain and anger and indifference to a concession that the Bomb "ended the bloodshed." 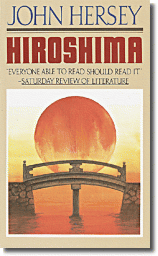 Immensely moving in its flat tone, which belies its immediacy, Hiroshima may be the most unforgettable work of journalism in the 20th century. 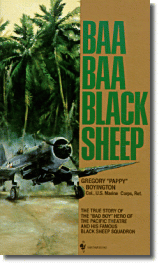 Marine Fighting Squadron 214 was known as the "Black Sheep" because it had been cobbled together from replacement pilots by the pugnacious Gregory "Pappy" Boyington. The rag-tag but deadly squadron lost its colorful leader--a drinker and brawler on the ground, an ace in the air--when Boyington was shot down in early 1944 in the South Pacific. Captured by the Japanese and badly injured, he somehow survived 20 months of prison-camp brutality. For a decade after the war, the Medal of Honor winner lived on beer, bombast and brag. But then he produced Baa Baa Black Sheep. Based on records of his missions, embellished and cocky in some places, ruefully self-deprecating in others, the book tells a story that might not be as it really was but is as it should have been. Click here to read Weintraub's other three picks.